Following the release of branded URLs, we’re excited to bring you another customizable aspect of your OneMob experience. Meet, the Player Page Editor! OneMob users are finding success using not only personal video, but all types of video- from customer testimonials to product demos. So we’ve given you the ability to control how your video player pages look and read. Yes, that’s pages with an s, because users can now create multiple layouts for any occasion. The possibilities for customization are endless. Hide response form: No reply needed for a certain video? No problem, just toggle it off. 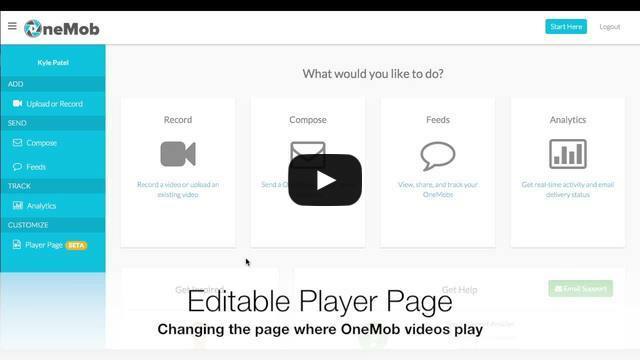 OneMob’s Player Page Editor is live and in Beta now. To start customizing your layouts, log into your OneMob account now. To start sending videos with OneMob, contact us.